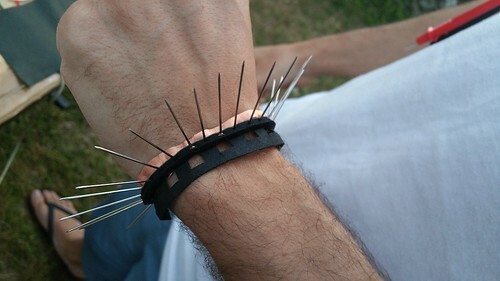 During PIFcamp 2016 Cedric Honnet got the analog version of the pin stroke sensing working! 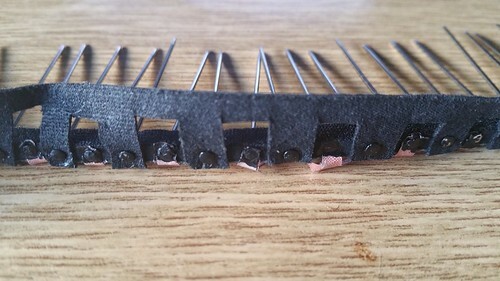 Probably the biggest problem was in the connection between the pins and the resistive fabric where the resistance of the connection was changing as the pin was stroked and so it was interfering with the reading of the resistive track’s resistance. A quick solution was to add some carbon conductive paint, but other solutions could involve using conductive fabric to make the connection between the pin and the resistive fabric, which would also allow the resistive fabric to be moved away from the area of interaction so that it would not be affected by pressure since it is also piezoresistive.